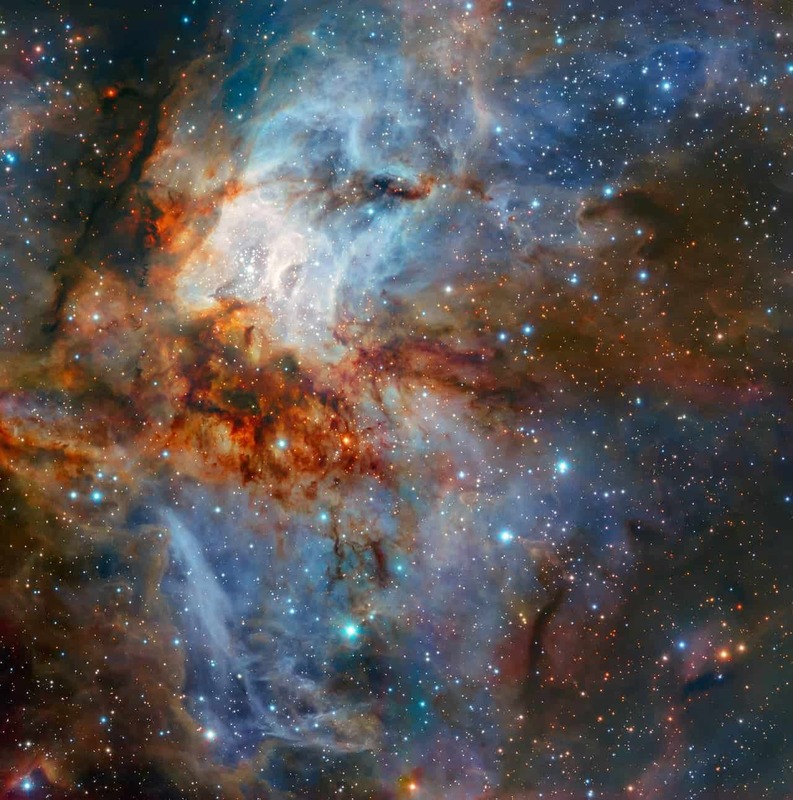 The European Southern Observatory just published a breathtaking image of a nearby star nursery. Image credits ESO / K. Muzic. Earlier today, we’ve talked about the first colors complex-ish life created — it was a story of algae, fossils, and pink. Moving on from this daring display by early life, however, I thought we’d seize the occasion to look at what colors accompany birth in the other direction — up in space. Our eyes can’t peer that far out, but, luckily for us, the European Southern Observatory (ESO) can. 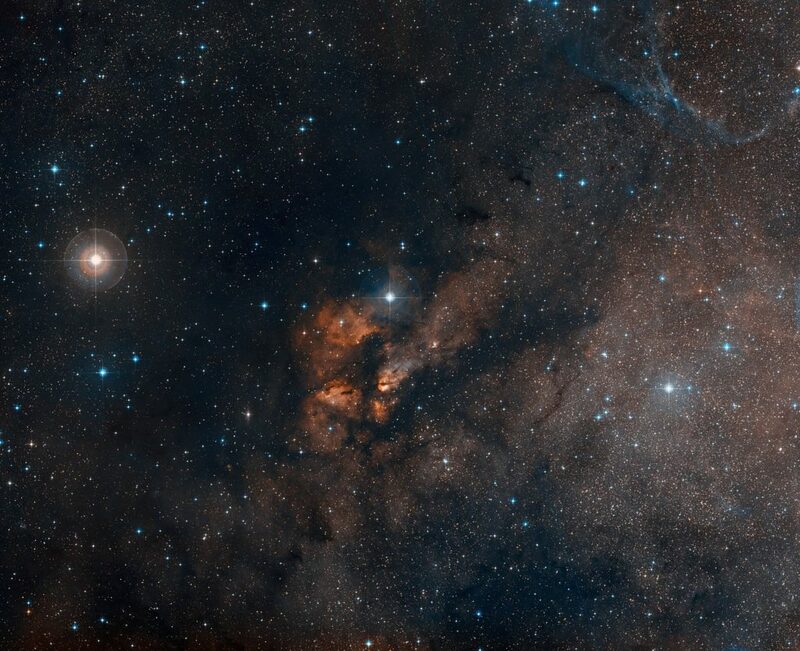 Using the HWAK-I (High Acuity Wide field K-band Imager) infrared imager mounted on the Very Large Telescope (VTL) in Chile, the ESO captured some spectacular shots of stars being born in the Vela constellation. RCW 38 in the constellation of Vela (The Sails). 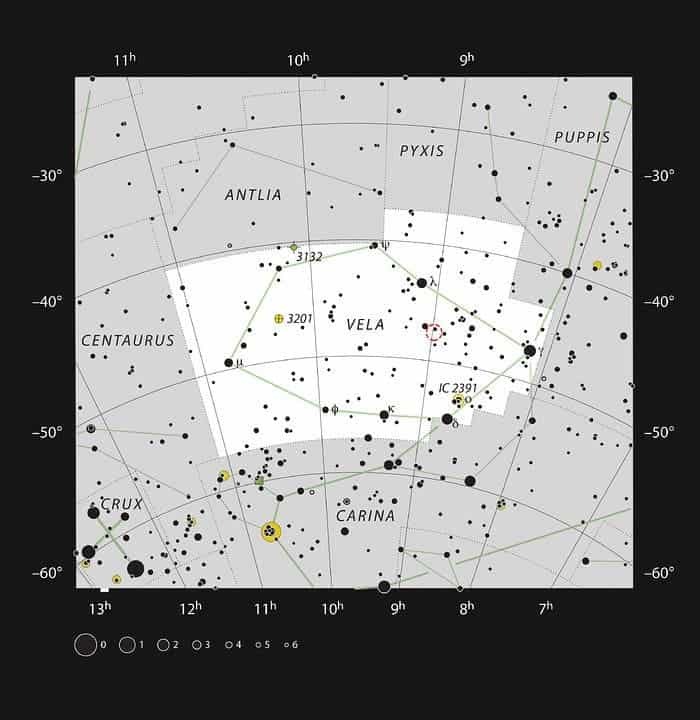 The map shows most of the stars visible to the unaided eye under good conditions. Image credits ESO / IAU / Sky & Telescope. The image depicts the star cluster RCW 38 as seen in infrared. ESO chose this bit of the electromagnetic spectrum for their observations since infrared can see ‘through’ the clouds shrowding star nurseries such as RCW 38. The cluster itself contains hundreds of young, brightly hot, and quite massive stars. Even at the relatively short distance of 5500 light-years away, however, their (visible) light can’t peer through the vast bodies of dust surrounding the cluster. The central area, seen as a bright blue region, houses numerous very young stars as well as a few protostars — ‘stars’ that are still forming. Observations by the Chandra X-ray Observatory revealed the presence of over 800 X-ray emitting young stellar objects in the cluster. You won’t be surprised to hear, then, that the area is drenched in radiation, making local gas clouds glow vividly. Cooler bodies of dust languishing in front of the cluster carry more subdued, darker hues of red and orange. The end result, a ‘colorful celestial landscape’ as ESO puts it, is quite the striking interplay of color and light. This image was captured as part of a series of tests — a process known as science verification — for HAWK-I and GRAAL (the ground layer adaptive optics module of the VLT). These tests are performed to ensure newly-commisioned instruments work as intended and include a set of test observations that verify and demonstrate the capabilities of the new instrument. Star cluster RCW 38 in the visible spectrum. Image credits ESO – Digitized Sky Survey 2 / Davide De Martin. Previous images of this region — snapped in the visible spectrum — show a very different sight. Optical images appear almost devoid of stars in comparison with those taken in the infrared spectrum due to dust obscuring the view. Peering through dense bodies such as dust clouds or nebulae is actually one of the HWAK-I’s main roles. The device also projects four laser beams out into the night sky to use as artificial reference stars — used to correct for any atmospheric turbulence, which can bend incoming light — to increase the quality of the final image.